The surge in climbing popularity during the last 20 years has brought with it a surfeit of images, photographs of well-toned climbers making their way up countless overhanging bulges and walls seemingly devoid of holds. So many pictures, numbered in the many thousands, that to some extent they have become a cliché. Except, perhaps, for a few that document accomplishments at the very edge of the current envelope. However, the number of photos of climbers on "difficult" ascents thins out rather dramatically as one examines the history of rock climbing - moving back through time for three quarters of a century, then into the Victorian Era. 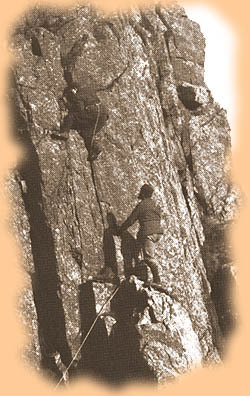 It is indeed our great good fortune that several climbers took the time and energy and patience to record the magnificent efforts of some of the few who founded the sport of rock climbing in the 1880s and 1890s and established the contours of ethical and technical evolution in the years that followed - particularly in the Lake District and Wales in Great Britain and the Saxony area near Dresden. I like to think that in some distant dimension these climbers still navigate their challenges, flowing up the rock - virgin in each encounter - with the same robust spirits, determination, and courage that led them onto the heights so many years ago. Here, then, is a look back into the early times of our sport. Brief descriptions of a few of the strong and unique personalities and photographs showing these - our forefathers more than mere predecessors - as they assemble the paradigm that, to a large extent, remains in place today. An American arrives in Dresden . . .
Oliver Perry-Smith : Born in Philadelphia in 1884, Oliver Perry-Smith attended St. Paul's School through his senior year, then sailed to Europe to join his mother in Dresden. There, he attended the Technische Hochschule (similar to MIT) and quickly became acquainted with several students who climbed. 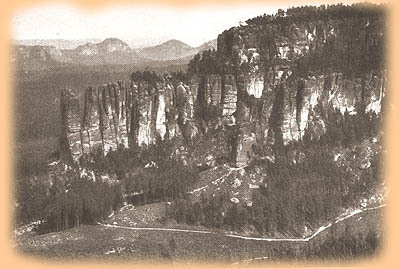 About twenty miles away, along the Elbe River, sandstone spires and walls had enticed serious scramblers since the 1860s, and by the time Perry-Smith arrived (1902) the spirit of competition among local climbers ran high. 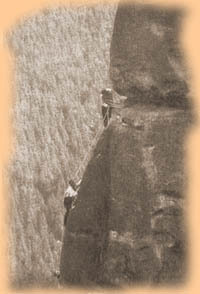 "By 1890 rock climbing in this region had become a pure sport. It was no longer a question of getting up by any available means, but of 'how' it was done. By 1898 a large number of summits had been gained by more than one route, O. Schuster and F. Meurer being pioneers." - J. Monroe Thorington in Oliver Perry-Smith: Profile of a Mountaineer (Journal of the AAC, 1964). Beginning as a Climber . . .
Perry-Smith's predilection for risk and his natural abilities as a climber surfaced early - one of his school mates at St. Paul's mentions in correspondence that Oliver would walk across four inch beams over fifty feet above the ground. Several years prior to his move to Dresden, he spent the summer at Bar Harbor, Maine, where - enthused by his grandmother's tales of watching climbers in the Alps - he scrambled down a series of cliffs to the ocean. It appears that he began climbing very soon after arriving in Dresden. A pioneer of early routes there comments : "On the first Sunday of May, 1902, I climbed the Hinterer Ganskofel with a friend. Suddenly I heard in the chimney leading to the peak a shower of curses and coughs and the word 'goddam'. In a few minutes a young man climbed out, hesitated and then greeted us and sat down on the other corner of the summit . . . . The new arrival wore nailed boots, an English sports costume and a broad brimmed hat. . . . At the final wall he explained that in nailed boots he could not climb this alone. I went to the top and offered him a rope for safety. . . . He introduced himself as Oliver Perry-Smith of Philadelphia, and said he was climbing here to train for ascents in the Alps. . . . This was the beginning of a happy mountain companionship. Every Sunday we went together and soon were after new climbs. . . . We went on to the Blosstock. 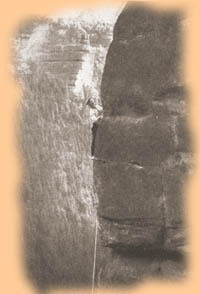 The beginning of the crack was funnel-shaped and difficult. . . . The next narrow chimney gave me no trouble, and, in a firm stance, I waited for Perry-Smith to follow. His girth was much greater than mine . . .[powerfully built, his companions described him as 'tall as a tree']. He tried with all his strength, but called that he must make a halt. Suddenly I heard rhythmic bum-bum-bum. At a distance of three meters the heartbeat of my friend was conducted through the rock!" - Albert Kunze in Jahrbuch für Touristik, 1954. 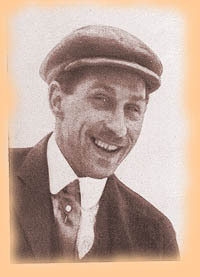 Perry-Smith went on to become one of the finest climbers in Europe, acknowledged by his German peers as a leader in the advancement of standards. He also loved to drive his Bugatti at high speeds through the German countryside! 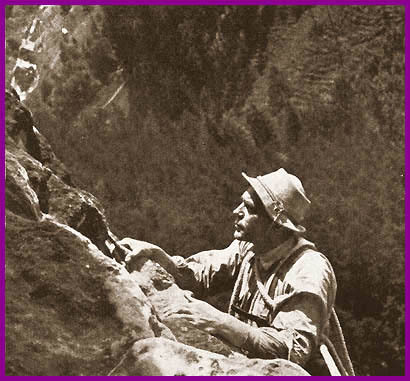 Read more about America's premier rock climber at the turn of the twentieth century . 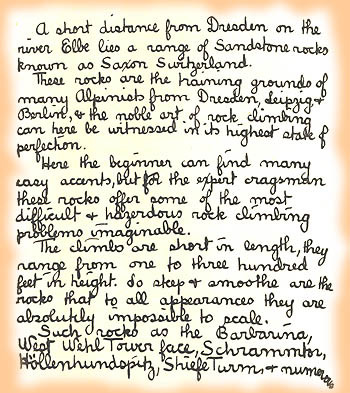 . . and of his German comrades, among the finest rock climbers in the world. Page 5.1: Elbsandsteingebirge: Vodere Gans. Kleiner Wehlturm. Friction climbing. Herringsgrundnadel.